It is hard enough to survive a massive earthquake in Nepal and for that to be followed by a horrific avalanche at Mount Everest. 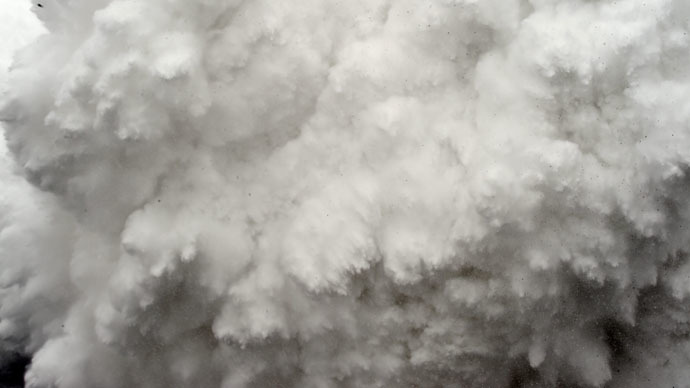 However, some climbers managed to capture the moment they were hit by a sea of ice and snow crashing into them on camera. A terrifying video posted on YouTube by German climber Jost Kobusch shows people at the Everest Base Camp stumbling in confusion as powerful the 7.9-magnitude earthquake hit Nepal on Saturday. Kobusch can be heard saying “the ground is shaking,” while laughing nervously at the start of the clip. The visibility was so poor, he was hardly able to see the slopes of the Himalayan Mountains. Climbers nearby begin scrambling, yelling and trying to warn others of the imminent avalanche. Caught off guard, people try to find some cover, but the wall of snow was quick and brutal. Cursing profoundly, the German hides in front of a tent with no proper protection. Seconds later, the climbers are buried by a wave of snow. One can hear Kobusch and another man trying to catch their breath, as the climber goes into a state of shock. The men in the video were lucky to survive, but the massive avalanche ended up killing some 20 people at the camp and injuring dozens of others. Rescue missions were launched, with the critically injured evacuated by helicopters. However, other rescue operations were hampered by bad weather, aftershocks and the fact that some 100 climbers were cut off from the Base Camp due to the collapsed Icefall route. A new 6.7-magnitude aftershock hit Nepal at 07:09 GMT on Sunday, which unleashed another series of avalanches in the Himalayas. An avalanche came close to hitting the base camp at Mount Everest as well, but luckily, fell just short. Over 3,300 people have been killed following the earthquake on Saturday, while more than 6,200 have been injured. Many hundreds are still unaccounted for. International organizations and countries have been sending aid to Nepal. On Sunday, Russian, American and Canadian aircraft flew out with rescue teams onboard. Sweden has pledged $1.5 million in aid, with Canada vowing to send $5 million.